Years after the defeat of the Reptilian Empire, Getter Team has begun training on a new super robot, Neo Getter Robo. But a surprise attack from the Empire's revived leader forces them to recruit a street fighter named Go Ichimonji as Getter One's pilot. Faced with an enormously powerful foe, the new team's only hope for victory may lie in the resurrection of the lost weapon of humanity, Shin Getter Robo. As this anime was lent to me by a friend on DVD, this is the first time I had viewed something from the Getter Robo franchise. From what I heard, the series, created by Go Nagai in 1974, is the earliest prototype of the combining mecha genre. Though, you have to hand it to Mr Nagai, being the guy who laid out the blueprint for the entire mecha craze. The basic outline of the franchise: The Reptilian Empire (a race of dinosaur-man hybrids) attacks humanity after leaving the underground for the first time in millions of years. A Reptilian mecha is captured by the humans, modified and used time and time again to foil their plans. That mecha is the Shin Getter Robo. Sounds familiar? You've seen this concept in just about every mecha anime that followed. Heck, studio Gainax practically cited this as an influence for Tengen Toppa Gurren Lagann. And it shows, because where else would that drill symbolism have come from? The story is nicely paced for a 4-episode OVA, albeit a very short series that might have very well been given a higher budget and released into cinemas as a feature film. Though I don't blame the director and crew, since this is a sequel to the original series' movie. On the other hand, being the first of the franchise that I had ever viewed, I quickly realized that by the end of the first episode I had enough background on the original series' formula to get a grasp at what was going on. Since this is an OVA, only four characters had more on-screen time than anyone else: Gou, the hot-headed, macho wrestler, Shou, the quiet female pilot, and Gai, the tubby supporting pilot, and Ryoma Nagare, the original team's leader. The three new characters are stand-ins for the original team and quite possibly the next generation if any future sequels are produced. Despite very little character development, if any at all, the hot-headedness of the male pilots practically provides the humor when appropriate - you can even see where Gurren Lagann got it's 'GAR' from. That, and the cringingly-funny Engrish spoken when the two American pilots are introduced up the humor to eleven. The mecha designs are where SGR vs NGR truly shines. The Reptilian Empire's mecha are biological and bleed, whereas the Shin Getter Robo is part biological and part mechanical (Evangelion, anyone? AND YES, I know Evangelion was released 5 years before this OVA, but the original Getter Robo came out in 1974). The American team's mecha has to be seen to be believed, or taken seriously for that matter. The rough and vicious look of the characters echoes Go Nagai's manga and earlier anime works, and juxtaposed against beautifully drawn backgrounds is a nice touch. The animation is pretty outstanding for an anime that was produced in 2000. It's fast, brutal and despite showing age still stands out to anything covered in excessive CGI (and Macross Frontier still comes to mind - don't get me wrong I LOVE the Macross franchise). The music is also quite atmospheric and sets the feeling of each scene quite appropriately. The sound effects are cinematic and add more to the action and drama. The opening theme 'Storm' by JAM project is a catchy number, though by the standards of something like 'A Cruel Angel's Thesis' is not too special. I'll be forward and straight on this: this was Gurren Lagann before Gurren Lagann. If you watch carefully, there are a number of similarities between Getter Robo and TTGL. However, most of these feel like tributes from the latter, and I'm respectful to the separate universes of both franchises. SGR vs NGR is a fun OVA. It's not very coherent at times if you hadn't seen the original series, but that wouldn't stop a new fan (like me) from going back to watch the original series or read the original manga. It's chaotic, loud and brutal but at the same time you get a good amount of fun for 4 episodes. Remember the olden days of super robot where there's no gray area and goodness always prevail? If you enjoy such shows or just want to reminisce about the past with a great, highly enjoyable show, then Shin Getter Robo Vs Neo Getter Robo (SGRvNGR) might just be your cup of tea. In general, SGRvNGR is an alternate reality version of the original Getter Robo franchise. 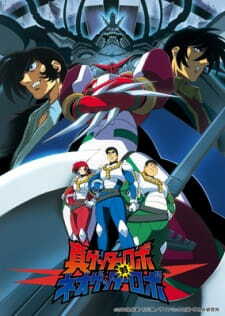 Without spoiling much of the original Getter Robo, it shows what might happen if Musashi (the original Getter 3 pilot) sacrifices himself to destroy the Reptilian Kingdom before the unfortunate event that changes the original Getter Robo from a regular fun-filled, monster-of-the-day anime into a story that made the 12 years old me loses all faith in humanity (not really, but you get the point). If the second act of Getter Robo, and its canon, Getter Robo Armageddon, shows a darker side of Go Nagai, then SGRvNGR portrays a lighter story akin to Mazinger Z where good people stays good and justice always prevail in the end. The story itself is nothing special. The story circles around Ichimonji Gou, the new candidate for the newly developed Neo Getter Robo: A safer and stable version of Getter Robo that is developed by the previous pilot of Getter 2, Jin Hayato to combat the upcoming threat from the newly reformed Reptilian Empire. - Throw cameos from most original Getter Robo characters. - Shows Neo Getter Robo in all of its three glories. - Tease just enough of Shin Getter Robo to make it interesting. - Introduce a fun super robot sidekick to the Getter Robo universe. - Made the kid in me shouts "Getter Change!!!" from the bottom of my lung. What's in it : Super Robot, hand-to-hand fight, giant axe, and lots of cameos. What's to like : Action packed story with excellent pace and enjoyment. What's not to like : Typical story with no character development. Mood needed to watch : Mood for a light and fun, no brainer kind of story. As an added bonus, the music and sound effects are surprisingly good and complement both the action and the story well. Try and watch this using a good sound system and you'll see what I mean. In short, SGRvNGR is something that you might like to watch after a long day's work just to relax for two hours. I can almost guarantee that you'll end the session with a big grin on your face and an urge to start every sentence with the word "Getter". With all that in mind, "Getter See You Later And Watch This Anime NOW!!!!!"